Paperback, 6.25 x 9.5 in. / 344 pgs / 215 images. 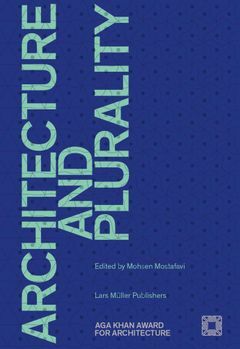 This book brings together a diverse range of exemplary architectural projects from across the globe. Carefully selected and examined by a team of experts, these projects demonstrate innovative approaches that respond to the challenges and potentials of contemporary conditions and contexts. One guiding principle of this cycle of the Aga Khan Award for Architecture is the importance of plurality. Since its inception the Award has aimed to be inclusive and to embrace the engagement of a diverse group of users. But equally, it has sought projects that explore a plurality of methods and architectures in achieving that goal. Here, the authors of the essays use that productive tension between architecture and plurality not only to provide a framework for the examination of the projects but also to explore the intellectual and projective means by which architecture and plurality can find other common grounds in the future. Mohsen Mostafavi is Dean of the Harvard Graduate School of Design and Alexander and Victoria Wiley Professor of Design. He has served on the steering committee of the Aga Khan Award for Architecture and the juries of the Holcim Foundation for Sustainable Contruction and the RIBA Gold Medal. FORMAT: Pbk, 6.25 x 9.5 in. / 344 pgs / 215 images.